Kathy Dunderdale is stepping down as the 10th premier of Canada's 10th province, saying she leaves Newfoundland and Labrador with a strong economy and a higher standard of living. Dunderdale, 61, said Wednesday she will resign as premier on Friday. Her decision comes after months of poor performances in public opinion polls and amid criticism, including from within the governing Progressive Conservatives, that she was failing to connect with voters who may have been growing tired of the Tories after three terms. Dunderdale met first with members of the Tory caucus at Confederation Building in St. John's on Wednesday, and then spoke publicly about her decision to resign. 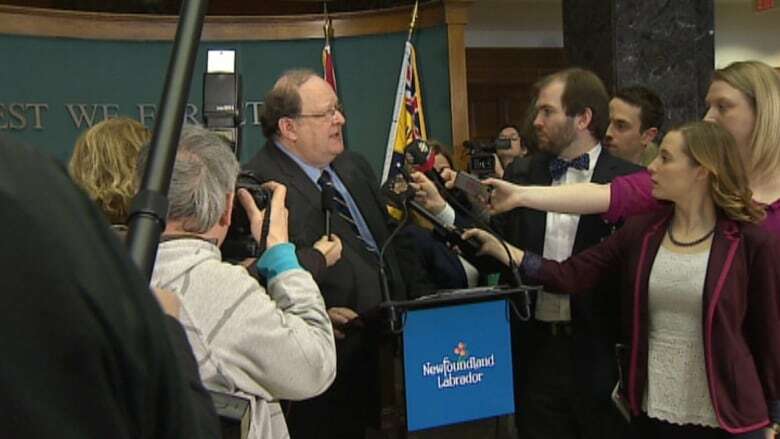 "Just as you know when it's time to step up, you also know when it is time to step back, and that time for me is now," said Dunderdale, who read from prepared remarks and did not take reporters' questions. Newfoundland and Labrador Finance Minister Tom Marshall, who is poised to become the province's 11th premier, speaks with reporters in St. John's on Wednesday. (CBC )​Dunderdale is staying on, for now, as the MHA for the St. John's district of Virginia Waters. Dunderdale said Finance Minister Tom Marshall will take over as premier on Monday. Marshall, who represents the Corner Brook district of Humber East, does not plan to seek re-election. Dunderdale's speech echoed themes she used both when she was sworn in as Newfoundland and Labrador's first woman premier and when she led the PCs to victory in the October 2011 election. Dunderdale said she was leaving with her head held high, and cited a long list of things that have improved since the Tories swept to power in 2003. "On every scale, Newfoundlanders and Labradorians are better off today than when we started," she told cheering supporters. "We have more jobs, higher incomes, lower taxes, lower public debt, greater capital investment, stronger business confidence, better opportunities and a higher standard of living today than when we came to office." Dunderdale made the decision to step down while on vacation in Florida, and on the heels of a political storm sparked by the defection of former caucus chair Paul Lane, who on Monday crossed the floor to join the Liberals. But political insiders say Dunderdale's resignation had long been in the cards, particularly when she could not make a fast rebound from polling results last year that put the governing Tories in third place. The Tories ran into their deepest problems last winter, with a cost-cutting budget that eliminated 1,200 jobs. "This has been mounting for a while. The writing has been on the wall, quite frankly," said Paul Oram, a former provincial health minister who has been vocal for weeks about a perceived need for a change at the top. Oram said many Tories hold Dunderdale in high regard, although there have been mounting frustrations with her often abrupt communications style. Dunderdale has been criticized for a lack of empathy, particularly when she insisted that island-wide power outages did not constitute a crisis. "Kathy's biggest issue has always been that the communications part of her mandate has never been received well," Oram said. "You can be the best leader in the world but the reality is that if the people are not accepting you as leader, and you just can't resonate with the people, then you can’t be leader of the party and leader of the province." The date of the next provincial election is now in flux, as well. Fixed-date legislation has the vote set for October 2015, although it is likely to be held earlier if the PCs select a new leader in the next few months. Provincial law dictates that a new premier must go to the polls within 12 months of being sworn in. Dunderdale, who had been a front-bench minister in Danny Williams' government as well as a former party president, talked about how well the province's economy is performing when she spoke to the media Wednesday. "I've been truly honoured and privileged to lead this province, which is leading the country," she said. Kathy Dunderdale gives Danny Williams a hug moments after he announced his resignation on Nov. 25, 2010. (Paul Daly/The Canadian Press)​Even some Tories, though, have pointed out that Dunderdale has been unable to capitalize on that economic success. Indeed, with Dunderdale's announcement coming so short after a caucus defection, speculation has mounted that she was under pressure to quit. But David Cochrane, host of the political affairs program On Point, said it appears Dunderdale's decision had been in the making for a while, although the pace may have accelerated. "People look at that and say the caucus isn't loyal and they're ready to push her out, but I could find no real evidence of that," he said. "What I found from talking to people in caucus and cabinet is that they were loyal to her, and they liked her, but that loyalty meant they were willing to allow her to choose the method of her departure. They recognized she wasn't going to make it to 2015. "It wasn't working, and you could see it in the polls — and she knew it, too." Dunderdale took time during her 12-minute speech to pay tribute to her political colleagues, the public service — she described them as "the finest people I have ever been privilege to work with" — and particularly her family. Dunderdale's voice briefly changed as she spoke about what her family gave up as she pursued her political career. "Public service always, always means great sacrifices for families, and so it has been for mine, but my family has been absolutely extraordinary," she said. "I could not have served otherwise." Cochrane said it had become obvious that the strain of political life, as well as being a daily target of political criticism, had taken a toll on Dunderdale and her family. "The negativity and the insults and the criticism had just gotten to the point that it was tough on her, but also tough on her family and the people around her," he said. Lorraine Michael, leader of Newfoundland and Labrador's New Democrats, said Dunderdale's lack of popularity with voters was her own doing. He told CBC News that Dunderdale was too aggressive with pushing her political agenda, including Bill 29, a law that substantially reduced the amount of information the government is allowed to release to the public. "The policies that she's been pushing, such as Bill 29, Muskrat Falls, the no brooking of any opposition whatsoever, poo-pooing everything — I think she brought this on herself," Michael said.